Re-emergence was commissioned by developers Bridgehill for the Monaco development at Rhodes. Rhodes is a former industrial site on the Parramatta River that’s been redeveloped as a residential community. 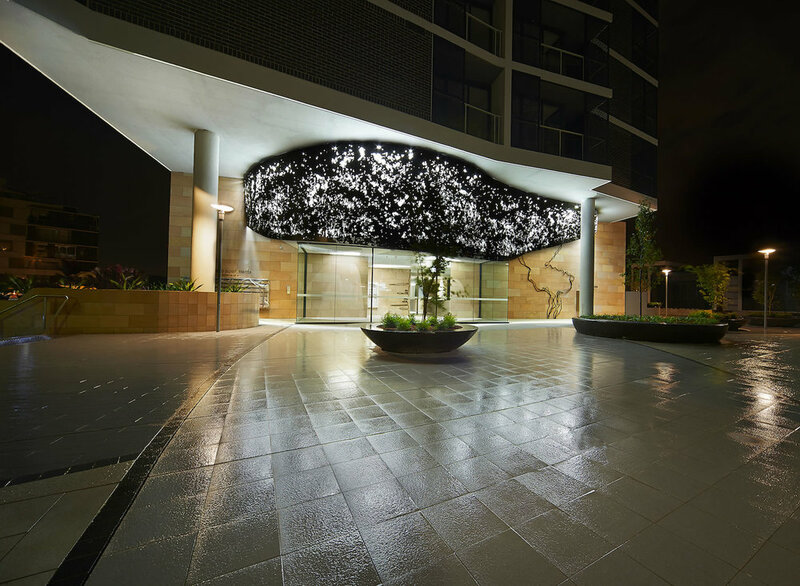 This work is an architecturally integrated artwork, providing an entrance canopy to the building. Smaller elements of the work continue into the entrance foyer, creating a sense of continuity. The pierced penetrations on the canopy are an abstraction of the patterns of light that penetrate the local mangroves, re-emerging now that heavy industry has left the site. Concealed lights create a dramatic night-time effect.